"Palliative care should not be the last resort ..... or about giving up. It's about increased quality of life and enhanced coordination of care. It is not about dying. It is about living with cancer. It's not less care. It's more care." Hospice care for animals is closely modeled after human hospice and entails all aspects of supportive care such as pain management, nutritional support, and emotional support for a terminally ill patient and their family. In general, hospice patients are expected to live weeks to months and all treatments are aimed at improving quality of life and easing the transition to end of life versus trying to cure the patient. Palliative care aims to alleviate pain and discomfort to improve quality of life for all patients with any end-stage illness. While these patients suffer from end-stage illnesses, such as severe arthritis, they may not be terminally ill. These patients may live for months to years with their conditions and require an integrative approach to their care to help provide the best possible quality of life for as long as possible. 1. Every day is a gift! You and your pet share an incredible bond and the time shared with each other is priceless. Live in the moment and cherish the time spent with your pet- sit next to them, lay down with them, pet them, read to them, be with them in mind and body. Your pet is very in tune to your emotions and may become stressed if you are upset. Try to maintain as normal a routine as possible and enjoy your time together. It is O.K. to cry and be sad but try to focus on what is in front of you now. Try not to dwell on your pet's impending death but instead fully experience this stage of your pet's life. 3. Let your pet lead the way. Remember, this journey is all about what your pet needs as they prepare for their final transition and their needs may change from day to day. Your pet will cherish the extra T.L.C. you are giving to him or her. However, they may not always feel hungry or want to be social with you. Respect their desires. These behaviors are not meant to be hurtful, your pet may just need this time to prepare for what lies ahead. 4. You know your pet best. Trust yourself to recognize what he or she needs. Be present with your pet so that you can meet these needs, whether it is pain relief, hydration, comfort, or company. Be willing to make small adjustments to your environment or schedule to help maintain the highest amount of comfort for your pet. Your pet will greatly appreciate your ability to adapt. 5. Know when to let go. Some pets will not pass on their own because they are holding on for their beloved human companion. Let your pet know it is O.K. to transition and give them permission to leave. Remember that euthanasia is a final gift of love, compassion, and bravery. While it is one of the most difficult gifts to give, find comfort knowing that a quality death is just as important as quality of life. Many pet parents agonize over whether or not they will know when it is time. By careful observation and trusting the bond you share with your pet, you will most undoubtedly know when it is time to intervene. Your life is so much better having shared it with your animal companion. Take comfort in your memories and share them with your friends and family. The bond you shared will live on in your heart forever and your special friend will never be truly gone. 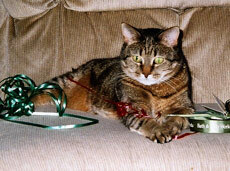 Find ways to commemorate your relationship and give thanks for the gifts your pet gave to you. The best tribute you can give to your pet angel is to share the love you experienced with others. While these terminologies are new to veterinary medicine, many veterinarians and pet owners have been implementing hospice and palliative care techniques for a long time. Even something as simple as massaging your arthritic dog or administering subcutaneous fluids under the skin of your cat with chronic kidney failure are ways of offering hospice and palliative care. In some cases, pets can be treated through hospice until they are able to pass naturally on their own. Unfortunately, this is not always the case and it is important to remember that pursuing hospice and palliative care for your pet does not preclude the necessity or availability of euthanasia if your pet is suffering. Regardless of what end of life options are chosen for your pet, hospice and palliative care can make your beloved companion's death a kinder, more intimate experience and the time shared together will further help to develop your unique bond with each other. It also gives families time to adjust to their pet's progressive disease and allows both you and your pet to say good-bye to each other in your own way. Do I accept that my pet is dying and we will make no more efforts to cure its illness? Have I discussed my pet's medications and their effects with my veterinarian? Do I have enough time in my schedule to spend the necessary hours looking after my pet? If not, do I have the resources to employ petsitters, volunteers, or a hospice team to aid in my pet's care? Does my family realize what home pet hospice care will entail? Can I cover the projected costs of pet hospice care- at least until I am prepared to say goodbye to my pet? Are there sufficient veterinary staff personnel to support me and my family through our pet's decline? Is someone available 24 hours a day if my pet's condition changes? What is the expected outcome? How might my pet's death occur and what arrangements will I make following my pet's passing? At Wholistic Paws, we recognize how overwhelming these decisions can be and we are prepared to coach and counsel you to see if hospice and palliative care is appropriate for your pet and your family. We are available for in home consultations to help review your pet's medical history, home environment, and current treatment plan. Together, we can decide the best options for your pet and we will do our best to keep your regular veterinarian involved in the decisions we make together. Once your pet is enrolled in our Wings of Grace Hospice Care Program, we will follow up with you as needed to help assess your pet's quality of life and pain management. We will compassionately provide you with the education and advice needed to care for your pet reinforced with meticulously written home care instructions. We will work with your unique concerns and empower you to provide the care your pet needs. We will also provide you with the resources you need to process your grief and emotional needs during this time so that you don't miss out on quality time with your pet. We strive to make ourselves as accessible to our hospice care families as possible to help answer any questions that you may have along the way. During the initial consultation, we will discuss aspects of hospice and palliative care and end of life decisions. We will create an individualized treatment plan that considers your level of ability and participation, while addressing your pet's comfort and medical needs. This initial consultation will be done in your home so that we can help to provide optimal comfort for your pet. Dr. Erwin will visit your family every 1-2 weeks or as is appropriate to help recheck your pet and to assess disease progression, answer major questions, adjust or add medications, discuss the well being of your pet and family, and make quality of life assessments. The staff of Wholistic Paws will provide detailed instruction for the primary pet care givers including: administration of subcutaneous fluids, injections, application of pain control patches, and all aspects of nursing care. These instructions will be demonstrated with you in person and will also be provided in writing for your reference. An integrative approach will be taken for your pet's pain management and may include treatments such as: acupuncture, massage, Chinese herbs, oral medications, injections, and pain patches. We will recommend optimum caloric intake and nutrition through excellent quality food sources (both commercial and homemade diets), assisted feeding, and appropriate supplements. You pet's hydration will also be addressed and extra hydration may be offered through subcutaneous fluid administration. This is one of the most imperative parts of your pet's care to help avoid pressure sores and ulcers. We will teach you how to maintain proper cleanliness through bathing, brushing, applying diapers, and other techniques. Your pet's quality of life will be better maintained if he or she can comfortably move about your house. We will teach you how to maintain your pet's muscle mass and keep their joints healthy through walking and home exercise programs and the use of harnesses, slings, and carts when needed. Because our consultations are done in your home, we can help trouble shoot mobility problems to give you solutions so your pet can keep moving comfortably and safely. We all want our last days to be spent in comfort and surrounded by those we love. Create joyful moments every day with your pet and try not to dwell on the impending loss of your pet. Grasp the value of these good moments and "present-time" thinking. This joy, mental stimulation, and interaction between your pet and your family through socialization, grooming, and activities will be an invaluable part of this journey together. Please contact us today if you feel that your pet is a candidate for our Wings of Grace Hospice Care Program. The sooner we can team up together on this special journey, the better we can provide for you and your pet's needs to help provide you both with a valuable, loving, and compassionate end of life experience.